God help me to be fully satisfied in you. The idea that I need to be in a relationship needs to be removed from me because ultimately I’m in a relationship with you God. I want to be fully 100% satisfied in you and at peace with the plan that you have prepared for me. Amen. The scariest part about asking the Lord to make me fully satisfied in Him, is that I’m also asking for peace if that means I’m called to be single for the rest of my life. I totally understand that you’re thinking “that’s a little extreme” but hear me out. We’re all called to be and to do something. While I have felt that I was called to be a wife and a mother my entire life, the Lord may not actually be calling me to be that. He could be calling me to be something different. Even though I’ve always dreamed of being a wife, ultimately He may not call me to fulfill that roll. I’m asking for grace in accepting that the Lord is fully in control, even when that brings me to my knees in emotions. When it comes to dating and relationships, I have thought that I knew better than God. That the relationships I was in, or men I was waiting on, were the right fit at that moment. But the crazy thing is, I have never been pursued by men the way I’ve pursued them. 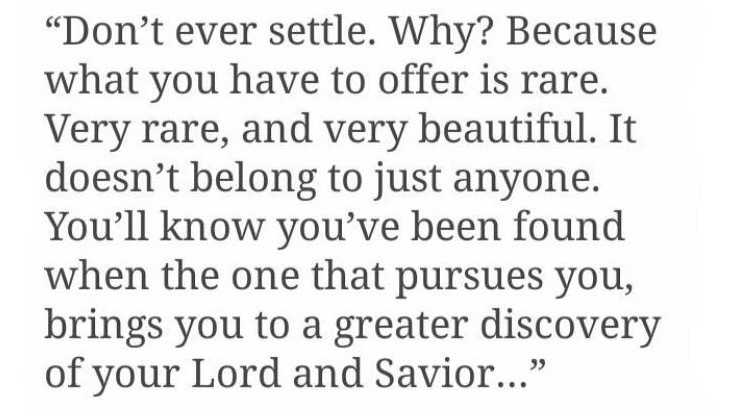 The way that I want and deserve to be pursued. But the Lord pursues me daily! Hannah Kerr as a song right now where the lyrics make me feel infinitely better. I would rather be completely and wholly content with being alone than go down another path where I’m going to be questioning every day where we stand. Relationships shouldn’t be that confusing and complicated. They should be exciting, and fun! While I’m anxious for that next chapter, I’m trying really hard to enjoy each coming day and let God take me down the paths that He chooses to send me down. Let go and let God. No matter how many times I tell myself that, it’s easier said than done.